Black students in schools across our nation are the targets of surveillance, police violence, and abuse in perpetuity. Some of these assaults are made known to the public, while many go under the radar, further subjecting Black students to more abuse, surveillance and neglect. This cannot be tolerated any longer. According to the Huffington Post, on January 15, 2019, at East Middle School in Binghamton in upstate New York, four 12-year old girls were strip-searched after being accused of acting too “giddy” and suspected of being under the influence of drugs. Later, no drugs were found in their system after being subjected to the humiliation and degradation of an invasive process. On January 25 at L.W. Higgins High School in Jefferson Parish, Louisiana, a high school senior had an altercation with a Jefferson Parish Deputy that left his face bloody and swollen according to his mother. In Chicago, Illinois, on Tuesday, January 29, 2019, student Dnigma Howard, was tasered by a police officer in school. In a video captured of the assault, one can see the officer tasing Dnigma while she was on the ground. Then, on Tuesday, February 5th, a video was released of a police officer assaulting a Black girl at Hazleton Area High School in Pennsylvania. Members of the Black Lives Matter At School movement will be holding rallies in cities across the country on February 6 & 7 to demand funding counselors not cops, including in Philadelphia, Seattle, New York City, Baltimore, and beyond. 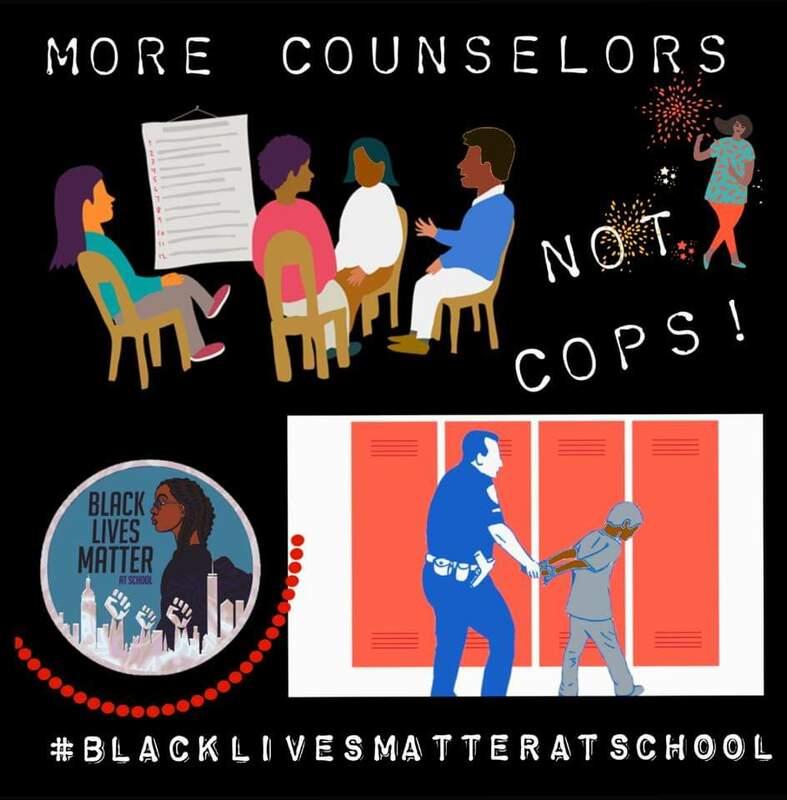 #BlackLivesMatterAtSchool will be joining Dignity in Schools to hold a #CounselorsNotCops Twitter chat on Thursday, February 7th at 9pm Eastern/6pm Pacific. Use the two hashtags to join the conversation. Assaults like these in schools are the reason that Black Lives Matter At Schools is vitally imperative. The collective value of Black youth should not be subjected to prison tactics within their schools. Arrests, strip searches, and physical assault should never be the norm. At its core, education is a developmental process that involves academic and social risk-taking, radical love, and holistic care. This growth requires a sense of safety if students are to develop to their full potential. Too many Black youth go to school in environments that perpetually violate their humanity and this sense of safety. Each of the incidents illustrate the need to invest in counselors instead of cops, and develop humanizing approach to how we work with and care for Black students. We at Black Lives Matter at Schools call for the immediate removal of and regular presence of police officers in schools.